The Bank of England issued banknotes in the UK as it does today. From 1945 there were three banknotes that you could spend in the UK, £5, £1 and 10 shillings notes. The £5 note was the classic fiver that the Owl and the Pussycat used to wrap up their honey and plenty of money. It was like notes issued by the Bank of England since 1793. But to make forgery difficult, the Bank printed it on watermarked paper with a metal thread running through it. Before the War, the Bank issued notes for denominations up to £1000. But the Bank withdrew notes of values larger than £5 in 1945. These notes were different to the white fiver. 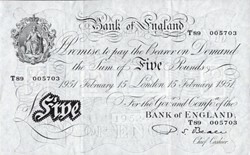 The design dates to 1928, although notes from that year were already withdrawn. They were the first notes issued by the Bank of England for amounts less than £5 since 1821. Before the First World War, people used gold sovereigns and half sovereigns instead. But economic difficulties in the War led to a need to print notes. The Bank of England was asked to supply some designs, but the UK Treasury issued their own notes instead up to 1928. None of the Bank of England notes had a picture of the reigning monarch. Before the War, the Bank of England was an independent organisation and it resisted any suggestion of state control. The designer's brief for the 1928 notes stipulated no Royal symbols. The old white £5 was a bit too large to be convenient, so the Bank issued a new fiver in 1957. It featured a portrait of Britannia on the front and a lion holding a key on the back. The reverse image represented the financial strength of the Bank. The new fiver changed how people used banknotes. In 1956, £1 notes made 75&percnt; of the total banknotes in circulation and £5 notes only 13&percnt;. In 1963 the new £5 made up 49&percnt; by value of all banknotes and the £1 note 43&percnt;. The new note made life easier for people because they needed to carry fewer notes. It also made life easier for the bankers as they needed to print fewer notes for the same value of money. For the 1960s the Bank of England introduced a new series of banknotes. Making forgery difficult was their biggest concern. They thought that a portrait of someone well-known would make forgery more difficult. People would spot something wrong with a familiar picture. The UK Government nationalised the Bank of England in 1946. So its directors had no objections to the portrait being of HM the Queen. The Bank did not replace all its existing banknotes at once. It introduced a new £1 note in 1960 and a new 10 shilling note in 1961. The £5 and £10 notes came in 1963 and 1964. If you think there is a difference in the design, you would be right. The £1 and 10 shilling notes were not liked by the public and the Bank chose a different designer for the £5 and £10. From 1970 the Bank of England started a new series of notes. They all had a portrait of the Queen, but on the back of the note, there was a portrait of a famous person from history. Growing popularity of the five pound note, The Times 17 July 1963, page 16 issue 55755. We are grateful to M. Veissed & Co for providing the images on this page.